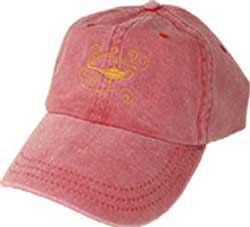 Baseball Cap with Embroidered Symbol Discounts Apply ! A meaningful, popular symbol adorns each of these stonewashed, 100% cotton Baseball Caps. Attractive and comfortable baseball caps with leather adjustable leather strap are one-hundred percent stonewashed cotton to keep your eyes shaded and your head cool. Baseball Cap with Embroidered Symbol5 I like the baseball hats, too. I agree with the "hat person." I got a blue one a couple of years ago. It has the "winged disc" logo and it's one of my favorites. . . wear it all the time. These baseball caps are really comfortable as well as nice looking. I got one of the Unicorn hats for my daughter and a "Genius" one for myself.